By Miłosz Panfil - PhD and Mateusz Mucha. The altitude? Is it a joke? Life hacks: how to peel an egg like a pro! Everyone cooks eggs differently. What sets this egg calculator apart is that it was created by Miłosz Panfil, Omni Calculator's chief scientist, who happens to have a PhD in Quantum Physics from the University of Warsaw. You may add half a teaspoon of table salt to help prevent the eggs from cracking. For the same reason, it's better to use eggs that aren't taken straight out of the fridge. Be generous with the amount of water; inserting the egg lowers the temperature, we want to be sure we're at the boiling point! Once the eggs are in the water, start the timer. When the time is up, take the eggs out of the pot and rinse them with cold water to stop the boiling process. That's the recipe in a nut(egg? )shell, but what's the science behind it? When we place anything in hot water it gets warmer, eggs included. The water begins by warming the shells of the eggs and then their interior, which consists of the white which surrounds the yolk. A soft-boiled egg should have a firm white and a runny yolk. While both the white and yolk coagulate (change from liquids to gels) in hot water, the white coagulates at a slightly lower temperatures than the yolk. So, for a soft-boiled egg, we should heat the egg to a temperature where the white have already thickened but the yolk has not. The calculator assumes that we get a perfect soft-boiled egg when it reaches a temperature of 65C (149F). So how much time does it take to heat an egg to this temperature? As soon as the eggs are in water, the shell's temperature quickly reaches that of the boiling water. The heat then starts to spread throughout the egg. This process is controlled by a heat diffusion equation which depends on two parameters: the heat conductivity and heat capacity. The heat conductivity specifies how quickly the heat spreads, while the heat capacity tells us how much heat we need to warm up the substance by one degree. From the heat diffusion equation, we can estimate the time t when the temperature between the white and yolk reaches our 65C. That's when we stop heating the eggs. Because the white is still at a noticeably higher temperature (the shell has a temperature of 100C/212F) even if we take the eggs out of the water, there will still be some heat transferred from the white to the yolk, meaning the yolk might coagulate. That's why we should cool down our eggs immediately after taking the eggs out of the water - so we stop the boiling process. ywr is a ratio of white to yolk. For a soft-boiled egg, the temperature T should be 65 degrees Celsius (149 F), so that's the value set in our calculator. For a hard-boiled egg, the temperature inside the egg should be higher, so the yolk coagulates. However, it cannot be too high because then the sulfur in the white reacts with the iron in the yolk and creates the greenish ferrous sulfide covering the yolk. To avoid it we should keep the temperature T bellow 77 Celsius (170.6 F). Why there is an altitude section in our calculator? The higher above the sea level you are, the more air pressure decreases, and therefore the boiling point of water decreases. That makes the cooking process more time-consuming. If you are high enough, like Mount Everest high, you won't get hard-boiled eggs. Water boils at 8848m (29029 ft) above sea level at a disappointingly low temperature of 68 degrees Celsius (154.5 F). For a more real-world example, a Bolivian city of El Alto, a home to over 1 million people, is 4150 meters above the sea level. Water boils at 85.9 Celsius (186.6 F), which translates to approximately 2.5 minutes longer soft-boiling time. That's crazy! Of course you can just crack the egg and then peel it, piece by piece, but why would you do it that way when you could just use one of these three time-saving hacks? If you don't have that much lung power, put the egg in a container filled with water, close it and shake really well. The peel will come off on its own. Want to try the third option? Crack the egg and roll it on the counter for a few seconds. Then, peel it while holding it in cold water. Works like a charm! Miłosz Panfil - PhD and Mateusz Mucha. 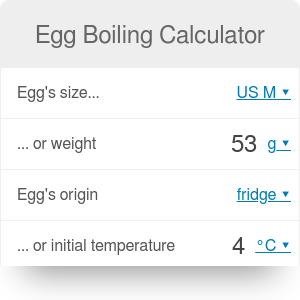 Egg Boiling Calculator can be embedded on your website to enrich the content you wrote and make it easier for your visitors to understand your message.